Around the year 1715, James Terry, Athlone Herald at the Court of James II in France, drew up a list of Irish families who had fled to continental Europe as ‘Wild Geese’. This list was presented to King James III and others. James Terry was an Irish officer who remained faithful to the Jacobite kings of Britain after their escape to the European continent. 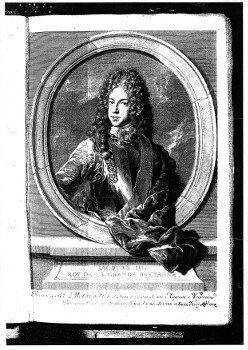 After the defeat of James II of England, the court went into exile in St. Germain, France. James Terry had been serving as Athlone Pursuivant of Arms in Ordinary at the Irish Office of Arms, and took his seal of office and his heraldic records with him to France. As James II still considered himself king of England, Scotland and Ireland, he needed a herald with him to handle matters of heraldry and ceremonial. In 1690 he had appointed Terry to the post of Athlone Herald. It is interesting to consider that during the exile, Terry was in communication with English and Scottish heralds when it became necessary to verify armorial records and genealogies. In spite of the dispute between the royals that employed them, the heralds still maintained a collegial working relationship. Terry continued granting arms to the members of the Irish diaspora until his death in 1725. After his death, the Irish abroad were obliged to apply to the Ulster King of Arms for grants. The original list extracts amount to 3 pages. The list is as originally prepared and has a lot of marks on it. However, the numbers to the right of each of the entries are the reference entries in the book containing the details on each family. These pages are extant. Some of the names on the list appear several times. The names are not in alphabetical order on the original but these are now presented as they appear against the modern version of the name. This second list consists of 5 pages. The modern name version is on left hand side and Terry’s version is on the right hand side. Unrecognised names are at the end of the list. The modern versions of the names were prepared under Dr Nollaig Ó Muraíle at the National University of Ireland, Galway. This brief data on James Terry was prepared by Maura O'Gara-O'Riordan and Dr Michael Egan.